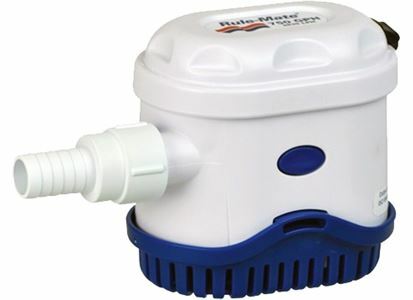 The new eco-friendly Rule Mate series of Bilge pumps feature a solid state water sensing technology that eliminates the need for a separate float switch. When water enters the bilge and reaches a certain height (2-3/4 inches) a sensor turns the pump on. After the water is pumped out, another sensor shuts the pump off. The sensor's unique "field effect" technology is programmed to recognize the dielectric constant of water only. In the event of an onboard oil spill, straight motor oil that enters the bilge will not turn the pump on. It's part of Rule's continuing commitment to preserving our waterway. The new Rule Mates are available in 500, 750 and 1100 GPH models. Rule has been building bilge pumps for 30 years. The pumps are preferred by yachtsmen and commercial fishermen the world over.